Divorce can be a highly complicated and nuanced legal experience. Some people who approach divorce are restricted to arguing their case through traditional litigation, while others will have the opportunity to explore alternative options like mediation and collaborative law. For most, using the concept of divorce mediation correctly is all about gaining a thorough understanding of what the process entails, what the benefits are, which divorce mediators to use and who you need to keep by your side. Remember, mediation isn't a solution to deal with your relationship problems, but it can assist you in understanding and negotiating the issues that will permit you and your ex-partner to pursue your separate lives. Mr. Darren M. Shapiro is an experienced litigator, divorce attorney, and mediator within the area of Long Island, and New York. He offers the opportunity for mediation to couples that approach his office as an alternative to standard litigation. As a mediator, Mr. Shapiro works to ensure that a discussion can be had about the future of both parties, wherein the steps to the future are outlined in a constructive, calm, and flexible manner. He believes that mediation is an exceptional solution for some couples that need to address custody and visitation rights, as well as the financial side of dissolving a marriage. However, the first step to ensuring that divorce mediation is successful, is making sure that you find the right mediator for your case. Finding the perfect mediator means searching for someone that both partners feel comfortable with. It also means looking for someone who has the right level of experience and training in their practice. A trained mediator knows the issues that need to be addressed during a divorce, from equitable distribution, to matters regarding support and maintenance. That mediator will give you the resources you need to discuss the legal grounds for divorce, and help you come up with agreements regarding parenting time, the distribution of assets and more. To help his clients determine whether he is the right divorce mediator for their needs, Mr. Darren M. Shapiro offers a free half-hour consultation appointment to couples contemplating mediation. During this time, clients can discuss the general questions about the process and topics covered, and get to know Mr. Shapiro in greater depth. They can ask questions about the intensive training that Mr. Shapiro underwent to help him understand the various techniques to promote non-biased communication and negotiation during a mediation session. This initial consultation can be very beneficial for those still determining whether mediation is right for them. Of course, choosing the right mediator isn't the only issue to consider when approaching mediation as a divorce solution. Clients also need to engage the services of a drafting attorney. A mediator like Darren that is also a lawyer is able to also fill the role of drafting attorney for his mediating couples. If a non-lawyer is used for the mediation process, then a legal professional will be required for the drafting process, during which clients will outline the terms of their agreement and uncontested papers for divorce. This attorney will be responsible for getting all the paperwork done regarding the divorce agreements, so that the process can move through the New York court system and result in a judgement of divorce. In different cases, Mr. Darren M. Shapiro acts as a collaborative lawyer, mediator, or a divorce attorney, which means that he can fill numerous roles during a divorce, depending on which process people choose for their divorce from the outset of engaging the Law and Mediation Office of Darren M. Shapiro, PC. However, it's worth noting that not all divorce mediators are necessarily lawyers. Some mediators come from a background within mental health, whereas others are financial planners searching for new ways to assist their clients. Mr. Shapiro can act as a mediator and a drafting attorney for the clients involved within the mediation process, so that they don't need to seek out an additional professional to help them move forward with their case after coming to terms about important decisions. Additionally, a review attorney may be necessary, and is always recommended by Mr. Shapiro, during the mediation process. In some cases, people may choose to use their review attorney to complete the drafting for their divorce mediation. However, in these circumstances the drafter isn't always a neutral party, because they will be the legal advisor for one of the spouses. This issue is why Mr. Shapiro often recommends using a neutral drafting attorney. For instance, in the cases where he acts as a mediator for parties in a divorce, he can also act as the neutral drafting attorney because the mediator is always objective. Importantly, in relation to review attorneys, Mr. Darren M. Shapiro always follows the recommendations given in the model rules for mediators. This means that he suggests that his parties use review attorneys to help them move through their case. A review attorney works in a divorce procedure to ensure that each party fully understands the rights available to them, what they're signing, and what they have agreed upon. Review attorneys may also offer advice to parties who are concerned or confused about their future. Sometimes, Mr. Shapiro's clients may neglect to use the advice of review attorneys, because they feel comfortable to move forward without one. However, Mr. Shapiro believes that the gold standard of mediation is supported by the use of review attorneys. The process of divorce mediation is a highly versatile and cost-effective solution for divorce that gives parties the chance to come to a determination about their future. 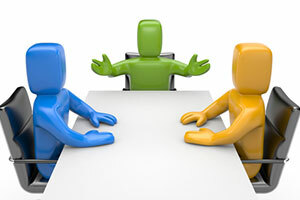 Unlike in litigation procedures, which can be highly complex for all parties involved, mediation places the client in the driving seat, and empowers them to gather the unique information that they need, communicate about the options available to them, and come to decisions that all sides can embrace. While the courts make fundamental decisions in litigation, mediation encourages clients to make their own choice, which is ideal for many couples. If you're interested in discussing the complexities of divorce mediation, you can contact Mr. Darren M. Shapiro for your initial, free half-hour consultation. Either contact us through our online form, or feel free to get in touch through a phone call to 516-333-6555.